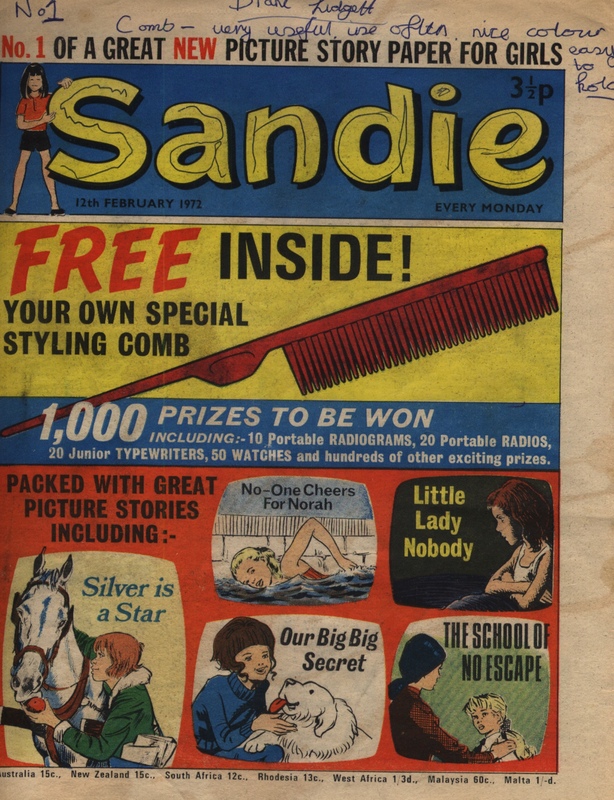 This is the first issue of Sandie. 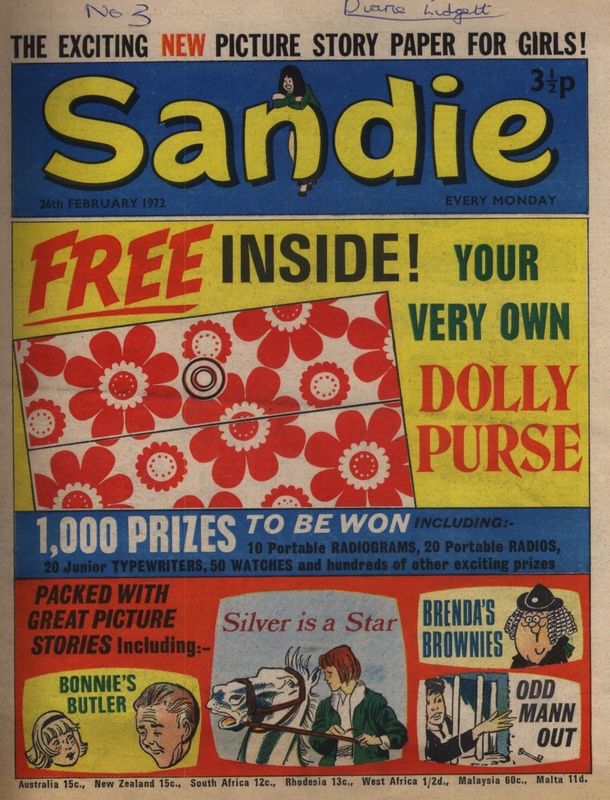 Through a stroke of fortune, I have just today got my hands on 69 issues of Sandie (and Tammy & Sandie). These were all bought by the mother of a girl whose name is shown on the issues as ‘Diane Lidgett’. The mother in question seems to have been something of a hoarder and the now grown-up girl – herself a mother and indeed a grandmother – recently unearthed them. The family wanted the comics to go to a good home and that’s what has just happened – that is, after they had had a good chance to re-read the stories themselves! If the pressures of work and other life stuff allow, I will post about each issue in order, as I come to them. As with the first issues of Jinty, this runs to 40 pages. It’s packed full of stories that are drawn by familiar names, though of course it is hard to know in most cases who wrote them. “Norah” looks like it is going to be a a tear-jerker Cinderella story, sharing a lot of similar ground with “Tricia’s Tragedy” in that a talented but poor swimmer needs to brave her way through challenges posed by wrong’uns from her own family as well as the difficulties put in her way by lack of money. “Little Lady Nobody” is a riches-to-rags saga – in the first episode, snobbish Miss Elaine quickly finds out that her father has died and left only debts, meaning that she has to become a servant in the very same snobbish school that she had previously made lots of enemies in due to her horrible attitude. Only one scullery maid is on her side after her downfall and everyone else is positively out to get her. Susie Mann is the latest of the Mann family to attend the posh private school that her ancestors started and which all of her family seem to have loved to make waves in. Susie is different, though – I had assumed at first that she might be a lovable klutz type, but by the end of this first episode it looks more like there might be something a bit sinister in how the school works, or at the very least that all her family members have enjoyed being bossy more than being kind and considerate. Whichever it is, Susie will definitely turn everything upside down, by the looks of it. Two sisters win a mystery prize in “Our Big BIG Secret” – a dog! They have been wanting one for ages but it’s the perennial question of where will they keep it, how will they pay for its food – and will their mother ever agree to let them keep it? it’s a fairly well-worn path but Jim Baikie’s art is always a treat and this has little humorous labels dotted here and there, in a way that foreshadows Baikie’s “Fran’ll Fix It!“. The new Earl of Locksley and his daughter are country bumpkins from rural America (though the editorial text says they come from Texas while the story intro says they are from Tennessee). Laughs ensue as the local high society mix with the rough and ready hillbillies. 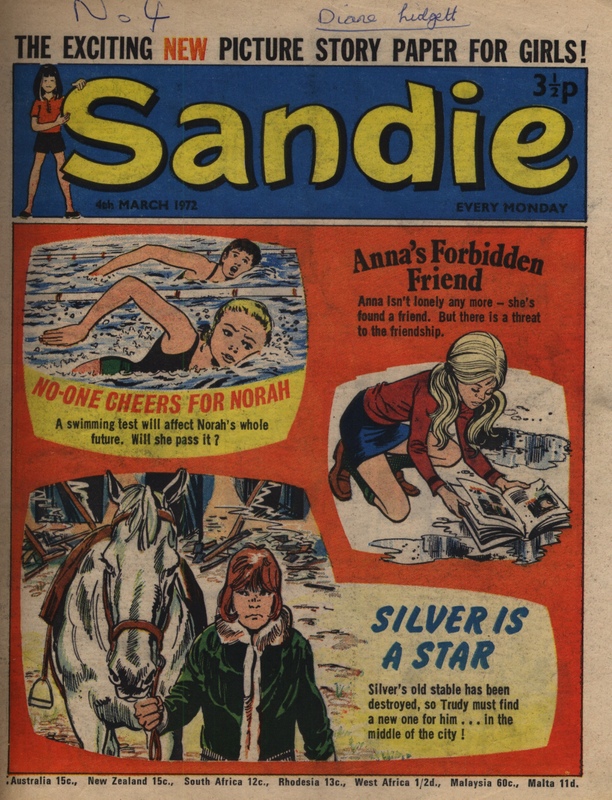 Wee Sue, in her debut, is quite different from the later stories. 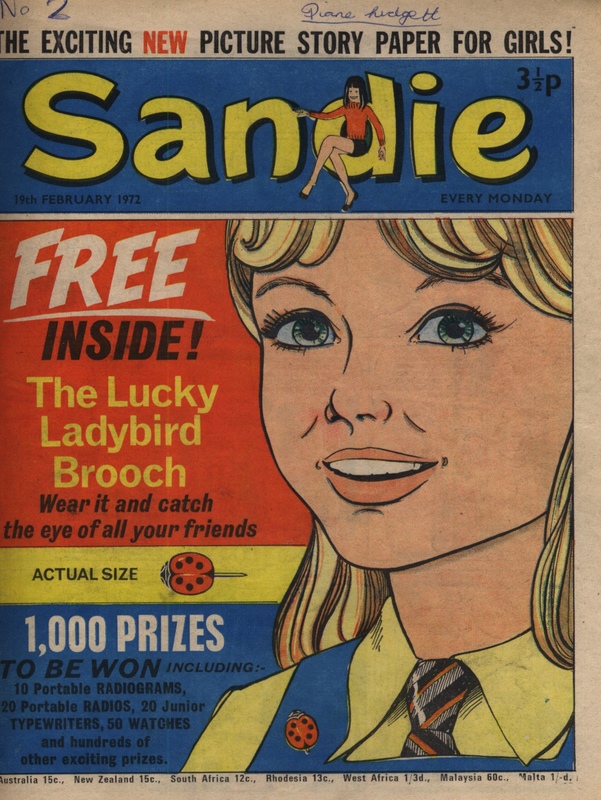 Here Sue Strong is a small girl full of big surprises – she is clearly capable of taking down a class bully through unexpected sporting prowess, which isn’t something I would really have associated the later Sue stories with. Bonnie Belthorp finds out that her family have inherited a butler, as per the will of the old lady that Bonnie’s mother used to do the cleaning for! This is a comedy story with a Jeeves-type character who is capable of winning through any situation. Trudy Parker is a poor girl who loves horses. She has a chance to buy ex-milk cart horse Star, who turns out to be a fantastic jumper – but will she find somewhere to stable him, let alone be able to enter into competitions? Her local rag-and-bone man is on her side, at any rate.